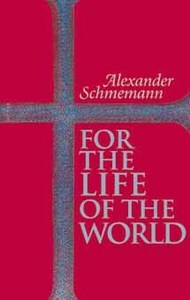 "In For the Life of the WorldAlexander Schmemann suggests an approach to the world and life within it, which stems from the liturgical experience of the Orthodox Church. He understands issues such as secularism and Christian culture from the perspective of the unbroken experience of the Church, as revealed and communicated in her worship, in her liturgy - the sacrament of the world, the sacrament of the Kingdom. Father Alexander Schmemann was a prolific writer, brilliant lecturer, and dedicated pastor. Former dean and professor of liturgical theology at St Vladimir's Orthodox Theological Seminary, his insight into contemporary culture and liturgical celebration left an indelible mark on the Christian community worldwide."